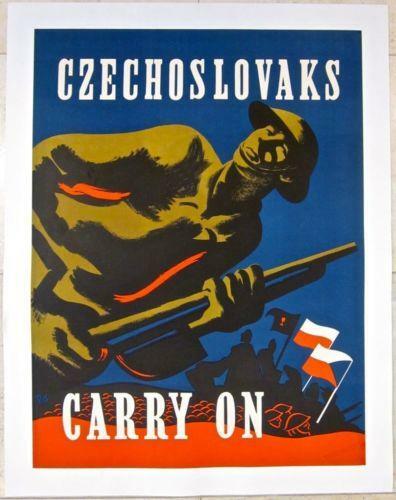 CUT $200 CZECHOSLOVAKS CARRY ON 1944 WWII LB POSTER – RARE PAZ SOLDIER ART!!! 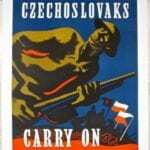 CZECHOSLOVAKS CARRY ON – ORIGINAL 1944 WWII LB POSTER – RARE PAZ SOLDIER ART!! !Original 1944 WWII Linen backed Advertising poster (24″ x 32″) Poster has a stamp at the bottom right and corner touch ups on the right side. This poster is overall in Fine to Very Fine Condition. Please refer to the accompanying image for a detailed view of this original advertising poster. We are adding new WWI and WWII, advertising and travel posters daily so please check back for new items! CUT $79!! WWI POSTER - RING IT AGAIN - BUY US GOV'T BONDS - GREAT ART!! CUT $79!! WWI POSTER – RING IT AGAIN – BUY US GOV’T BONDS – GREAT ART!! CUT $169!! DON'T BURN WASTE PAPER 1945 WWII LB POSTER - RARE RABKIN ART RECYCLE! CUT $169!! DON’T BURN WASTE PAPER 1945 WWII LB POSTER – RARE RABKIN ART RECYCLE!